Serious stopping power and improved cornering with Walkinshaw Performance Products Suspension and Brake upgrades. Genuine German made Bilstein sports shock absorbers and sports spring lowering kit. 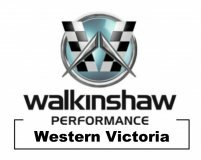 This package has been carefully tuned by Walkinshaw and Bilstein specifically for the Commodore to give great control and that great race feel. WPP Brake up grade Package.